It’s no secret that Higher Education costs are skyrocketing. Many families believe that a college education is out of reach, including some of our members. But, thanks to a collaboration with College for America, earning a college degree just became simpler and more realistic for SEIU/NAGE members! Online work & Flexible scheduling. No preset times and 24/7 access means members can work at their own pace. They can earn credits for real-world projects instead of just sitting through classes and taking exams. $3,000 per year or less. There are no additional fees or books to buy. Federal student aid and financing are available for all programs. Most students at College for America expect to graduate with zero debt. Accredited university. College for America, part of Southern New Hampshire University, is a nonprofit, accredited degree program created especially for working adults. Associate and bachelor’s degrees. Members can earn college degrees in fields like early childhood development, healthcare management, communications and general studies with help from dedicated learning coaches. 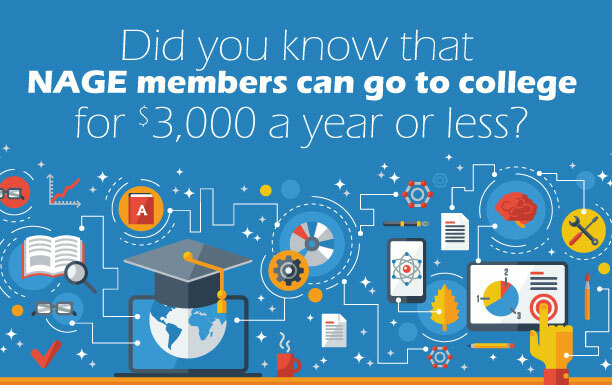 ​Because NAGE is affiliated with SEIU, you get to take advantage of this amazing opportunity! Register as an SEIU Local 5000 (NAGE) member HERE today! *Please note, due to a backlog of SEIU's member verification system, it will take several days for the Member Benefits team to reach out with registration instructions! If you receive an "unable to verify membership" message upon registering, this will be addressed by the Member Benefits team. Want Savings? 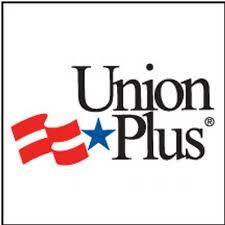 Find out how much you can save by taking advantage of Union Plus programs.